The details of the Federal Government's $3 billion cash-for-clunkers program were criticized for being too complicated, and the U.S. Department of Transportation's computers were maddeningly slow to produce the necessary approvals. But the program also gave dealers and consumers a huge shot in the arm. So was the money well spent? To get an answer, TIME contributor Joseph Szczesny spoke with Jesse Toprak, vice president of industry trends and insights at Truecar.com, a car-sales-data website. Toprak has more than 15 years' experience in the automotive industry, including nearly nine years with Edmunds, one of the largest sites for consumer information on the Internet. Was the cash-for-clunkers program a success? The short answer is yes. The program accomplished what it was set out to do, which was to get consumers back into the showrooms and to jump-start new-vehicle sales. With some creative marketing and wheeling and dealing, dealers were also evidently able to convert many nonqualifying shoppers into the buyers of other new or used cars, a trend that created a sizable positive impact on sales as an indirect consequence of the program. On the other hand, the clunker program was overly complicated, a nightmare to manage for dealers and difficult to understand for consumers. I would give the pure sales impact of the program an A and the administration of the program a D.
In the end, how many cars were sold through the program? The official total sales that were directly because of the program will be right around 700,000 units. The average incentive  based on the most recent data available  was around $4,200. If we simply divide $3 billion by $4,200, we get about 714,000 units. The original forecast for 250,000 units was based on the initial $1 billion budget for the program. Who benefited from the program? From the manufacturers' perspective, everybody except for the luxury carmakers. Hyundai, Kia, Toyota, Honda, Nissan, as well as Ford and GM's small-car lineups all experienced sizable sales increases. The perfect vehicle for the program was the sub-$20K midsize compact car. You will have a tough time finding any inventory that fits that description in most dealer lots today. More importantly, the program was a lifeline thrown at severely cash-strapped dealers. Sales were up. So were the profits. Consumers tend to drop their guards when there are big incentives, assuming that they will get great deals no matter what. As the clunker sales reached a fevered pitch, I think it's fair to say that the deals got much stingier. 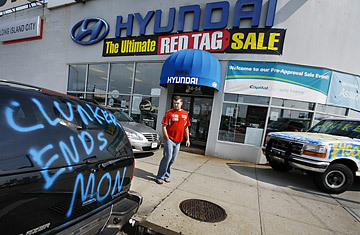 Many shoppers could have gotten better deals if they had done their homework before going to the dealership. How far will the economic stimulus from the program spread? The economic impact of the program is significant but short-lived. If we assume an average selling price of $25,000 for the program, and total unit sales of 700,000, the cash-for-clunkers program generated at least $17.5 billion of economic activity, not including incremental sales of additional products, such as extended warranties, alarm systems and financing revenue for the dealerships  as well as roughly $875 million in sales-tax revenue for state governments. When we add in the fiscal multiplier effect, the net impact of the program was easily north of $25 billion  if not much higher. However, the impact also has a short life expectancy. Once the program is over, the impact is pretty much over as well. It will be the next challenge for manufacturers as well as dealers to try to figure out a way to ride the program's coattails. Are manufacturers like GM, Hyundai and Ford wise to boost production at this point in the economic cycle? Yes, as long as the production increases are done for the right type of vehicles  such as high-demand, low-supply, gas-efficient cars and crossovers  and for the right price point. Recently announced production increases are modest and fit this description; therefore, I'd agree with them. The worst-case scenario for dealers  and the manufacturers  is to have qualified buyers on your lot and not have the inventory to sell. Some economists worry that the clunker program borrowed sales from future months, so we'll soon be hit with an ugly payback. I think that the payback-factor predictions for this program have been greatly exaggerated. I would argue that hundreds of thousands of potential new car buyers actually postponed buying a car within the last year due to economic uncertainty, and some of them ended up buying within the last few weeks due to the CFC program. That is, it motivated people to buy who had not been planning to do so, which means there shouldn't be a bad sales payback. Having said that, there will be a natural decline in new-vehicle sales for the rest of the year when compared to August levels unless we see a new stimulus or record manufacturer incentives. Without those stimulants, we'll go back to the preclunker levels of about 10 to 11 million annual vehicle sales. The program did reduce inventories. Will this affect manufacturers' incentives over the next few months? For the next four to six weeks, it will result in a drop in incentives for most categories. Once the additional production starts arriving on the lots, probably starting in late September, we will see the incentives start to climb back up, and that should last for the rest of the year. Some dealers thought credit [worthiness] could be an issue, but customers cashing in on the program seemed to have no trouble finding financing. What happened? For one thing, the CFC incentive was used as all or part of the consumers' down payment, automatically increasing loan-approval rates  the bigger the down payment, the higher the approval rates for car loans, everything else being equal. The $4,500 incentive sometimes was doubled by manufacturer incentives. Even if you have less-than-perfect credit, if you put $9,000 down on a $25,000 vehicle, you have a good chance of getting approved. We also saw the captive finance companies becoming more flexible during the promotion in their approvals. Do you think Congress is going to be tempted to do it again? It will be wait and see for at least the next couple of weeks. If the auto-sales rate drops below expectations, there is always a chance Congress may come up with a similar or totally new stimulus idea, but that won't likely happen unless we experience another period of sustained sub10 million level [in annual car sales], which I hope never happens again.